Or Yehuda, Israel, May 12, 2015 – Formula Systems (1985) Ltd. (NASDAQ: FORTY) a global information technology company principally engaged, through its subsidiaries, in providing software consulting services, developing proprietary software products, and providing computer-based business solutions, today announced its results for the first quarter of 2015. Revenues for the first quarter ended March 31, 2015 increased 12% to $194.4 million, compared to $173.5 million in the same period last year. Revenues for the first quarter increased by approximately $41.0 million due to the consolidation of the results of operations of Sapiens, which were not consolidated during 2014, offset by $27.3 million that were included in the same period last year due to the consolidation of Magic's results of operations in part in the first quarter of 2014, and which were not consolidated in the first quarter of 2015. Operating income for the first quarter ended March 31, 2015, increased 90% to $13.3 million compared to $7.0 million in the same period last year. Operating income for the first quarter increased by $5.1 million due to the consolidation of the results of operations of Sapiens, which were not consolidated during 2014, offset by $4.0 million that were consolidated in the same period last year, due to the consolidation of Magic’s results of operations in part during the first quarter of 2014, and which were not consolidated in the first quarter of 2015. 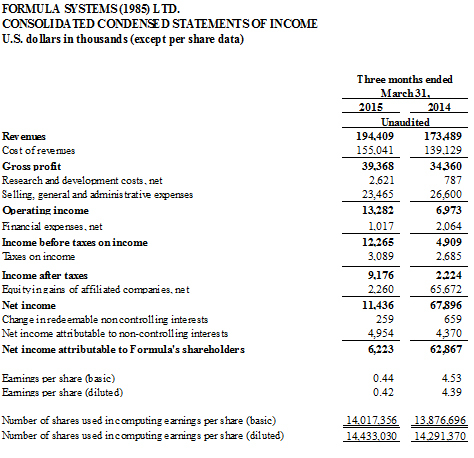 Net income for the first quarter ended March 31, 2015 was $6.2 million, or $0.42 per fully diluted share, compared to $62.9 million, or $4.39 per fully diluted share, in the same period last year. Net income for the first quarter of 2014 was positively impacted by the net gain of $67.2 million recorded in relation to Magic Software’s March 2014 public offering pursuant to which Formula's holdings in Magic were reduced below 50%, which in turn resulted in Formula's investment in Magic being accounted from March 2014 under the equity method of accounting and the related re-measurement to fair value of Formula’s investment in Magic. As of March 31, 2015 Formula held 50.0%, 50.0% and 45.6% of the outstanding ordinary shares of Matrix, Sapiens and Magic, respectively. Consolidated cash and short-term and long-term investments in marketable securities totaled approximately $161.3 million as of March 31, 2015. 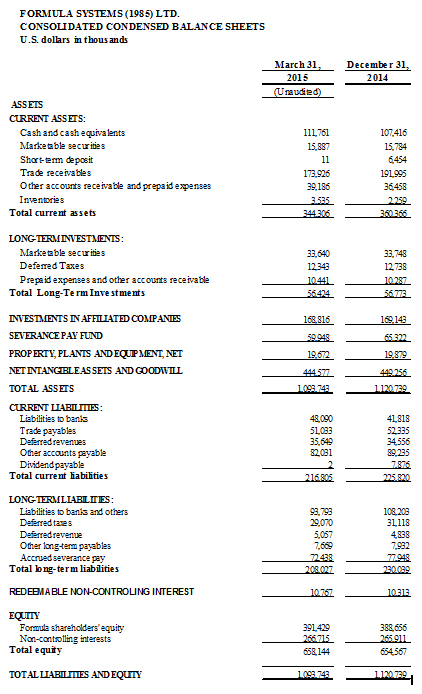 Total equity as of March 31, 2015 was $658.1 million (representing 60% of the total balance sheet).